The siblings of the title are Tim Holt and Steve Brodie. 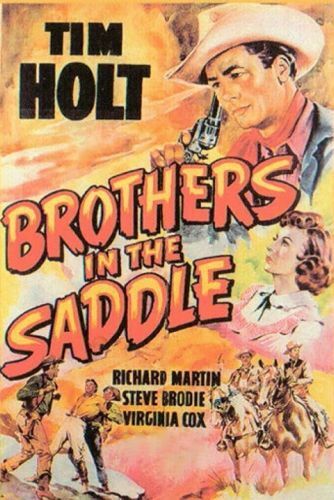 Holt is the good guy (after all, the film was part of Holt's RKO western series), while younger brother Brodie is the hotheaded troublemaker. The film offers a wealth of fistfights, gun duels and pursuits on horseback, as well as a dash of romance. Holt doesn't get a leading lady--at least not at first--but Brodie's fiancee is played by newcomer Virginia Cox. Brothers in the Saddle was the third Tim Holt vehicle to be directed by western specialist (and future minor cult figure) Lesley Selander.